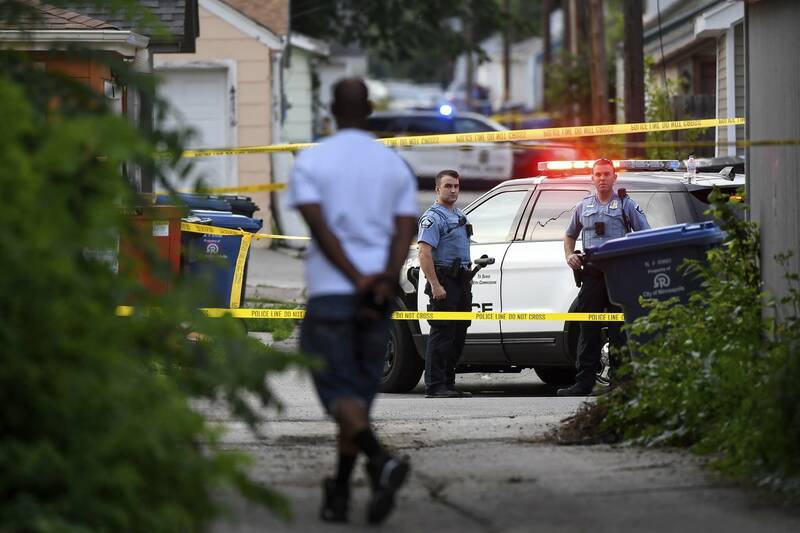 The Twin Cities metro has seen three fatal shootings this summer by police officers. In each case, prosecutors use the language in state law to decide whether the officers' use of deadly force was justified or not. 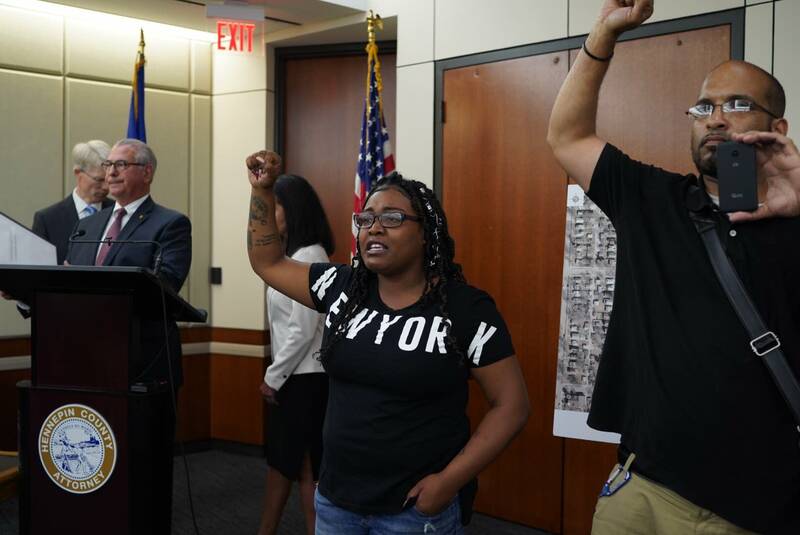 When Hennepin County Attorney Mike Freeman announced he'd decided not to charge the officers who shot and killed Thurman Blevins on June 23, Freeman cited the state law, which he said "provides a significant defense to criminal charges against an officer." The prosecutor's comments drew jeers from Blevins' family and supporters in the room. Blevins, 31, had been shot to death after fleeing police officers. Police body camera footage showed him with a gun in his hand at the time of the shooting. Blevins' cousin Sydnee Brown took over at the podium after Freeman walked out. "As Mike Freeman was trying to say, since he supposedly doesn't make the decisions in regards of who prosecutes the police, but it's in law," Brown said, "maybe we need to take it to the government, maybe we need to start changing some laws and regulations around here." High-profile killings by police officers have prompted discussion about the laws, which give officers wide discretion to use deadly force and set a high threshold for prosecution. About 1,000 people are killed by police in the United States each year. Criminal charges against officers in these deaths are rare, according to a database maintained by Bowling Green State University Professor Phil Stinson. Only a few dozen officers have been convicted or pleaded guilty to murder or manslaughter charges for an on-duty shooting in the last 15 years. 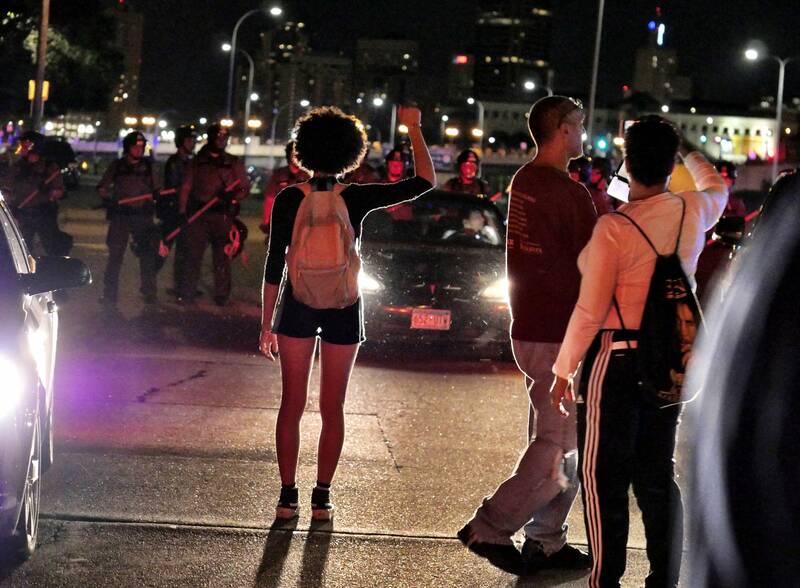 In Minnesota, no officer has ever been convicted for killing someone while on duty. St. Anthony officer Jeronimo Yanez shot and killed Philando Castile during a traffic stop in July 2016 and was later charged in Ramsey County. However, Yanez was acquitted last year on all charges. 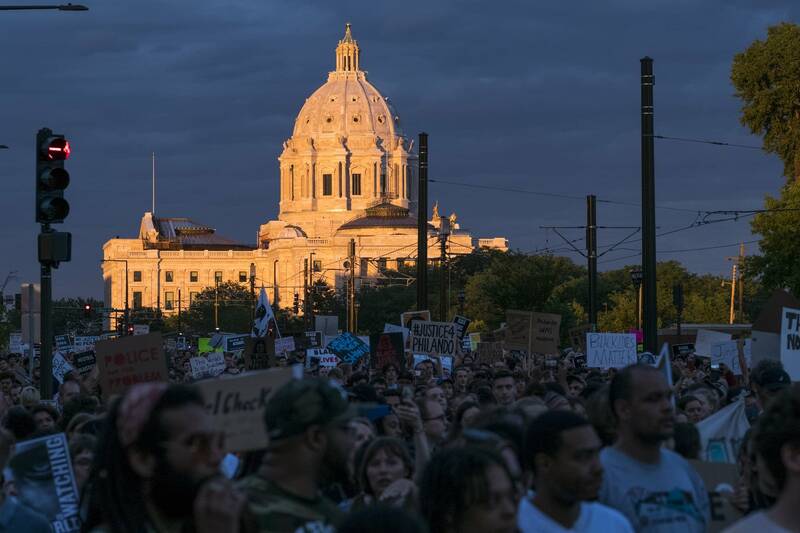 Jurors in that case pointed to the law authorizing police to use deadly force to explain their decision to find Yanez not guilty, with one juror even saying that critics should "go after the law" if they disagreed with the verdict. "Whether or not the law is the standard by which people are held, or whether it's just an internal policy, I think people are just crying out for some sort of accountability," said James Densley, a Metropolitan State University criminal justice professor. The language written into the law is an acknowledgment that officers have a tough and dangerous job where they often have to make split-second decisions, Densley said. It sets a very high threshold for prosecuting an officer who uses deadly force. "This is what's known as the objective reasonableness standard," Densley said. "Essentially what that means is we have to look at the standard of an objectively reasonable police officer on the scene at the time, rather than with a sort of 20/20 vision of hindsight." 1) To protect the officer or another person from death or great bodily harm. 2) To capture someone who the officer believes has committed or attempted a felony involving or threatening deadly force. 3) To capture someone the officer believes will cause death or great bodily harm if the apprehension is delayed. In practice, the law boils down to a "subjective" perception about whether an individual officer felt threatened, Densley said. "If they believe they saw a gun, even if that gun may have been a cell phone or a wallet or may have been nothing at all," Densley said, "if they believe they've seen that and therefore have made decisions accordingly, that would then be justified under that existing law." The Minnesota law governing use of force isn't unique. Most states have laws that offer similar discretion for officers in cases where they use deadly force. But some are proposing that the law be changed. George Washington University Law School Professor Cynthia Lee published an article recently that included an analysis of current laws and a proposal of how they might be adjusted. "The existing statutes tend to focus on the reasonableness of the officer's belief in the need to use deadly force," Lee said. "What I argue is that the law should be reformed to include a focus on the reasonableness of the officer's actions, separate from the reasonableness of the officer's beliefs." The model legislation Lee proposes would allow juries and prosecutors to not only consider whether the officer believed that a suspect posed a threat, but also to look at the other factors that led up to the use of deadly force, for instance, whether the suspect refused orders to drop a weapon. It could potentially apply to all charges associated with a deadly force incident, not just murder or manslaughter charges. "If you focus on the reasonableness of the officer's actions," Lee said, "that allows the jury to think more broadly about what sort of things the officers might have done to defuse the situation or de-escalate so the situation wouldn't get to the point where deadly force was necessary." Lee believes changing the law around officer use of deadly force likely won't result in more convictions of officers by juries, but she said it could make it easier for prosecutors to charge officers when appropriate. It could also lead to shifts in cultural attitudes within police departments. "I'm not recommending that all police officers be charged when they use deadly force," Lee said. "But in cases where there was something else that could have been done or a life was taken and it shouldn't have been, those are the types of cases where I think my model reform could make a difference." Lee's model legislation hasn't been adopted anywhere yet. State Rep. Ray Dehn, DFL-Minneapolis, represents the district where Blevins was killed, and attended community meetings and vigils after his death. Dehn said any changes to the statute around deadly use of force need to involve discussions with both cops and critics. "Policing is a tough job, when you say goodbye to your family or your loved ones in the morning, there's no 100 percent guarantee that you're coming home that evening," Dehn said. "There needs to be a lot of respect on what officers do, but there also needs to be real accountability when they do things that I and many other people consider outside the scope of their authority." Dehn said the public discussion about changing the law has already started, but that it's been too vitriolic from both sides. He said he may offer a bill next session to start the dialogue at the Legislature. "There are clearly changes we can make to the law," Dehn said. "The question is: Is there the public support? Is there the political will for individuals outside the Capitol as well as at the Capitol to make those changes?" State Rep. Nick Zerwas, R-Elk River, said there's already a set of procedures outlining how police are trained, and how a police shooting is investigated and considered for prosecution. "In very quickly unfolding and fluid situations where there is an imminent threat of deadly force, a police officer has been trained under Minnesota state law to stop that threat as quickly and as efficiently as possible," Zerwas said. Zerwas does see an opportunity for people to talk about de-escalation training or other issues around police use of force, but not to change the law. "I'm just not aware of an appetite that there would be to change current state statute to require a police officer to somehow be in even more of a risk of imminent great bodily harm or death before being legally allowed to use deadly force," Zerwas said. The law is something prosecutors around the state have already taken into account while deciding whether to file charges. In the second instance of an officer in Minnesota charged for killing someone while on duty, Hennepin County Attorney Freeman decided earlier this year to file charges against former Minneapolis officer Mohamed Noor in the shooting death of Justine Ruszczyk in July 2017. 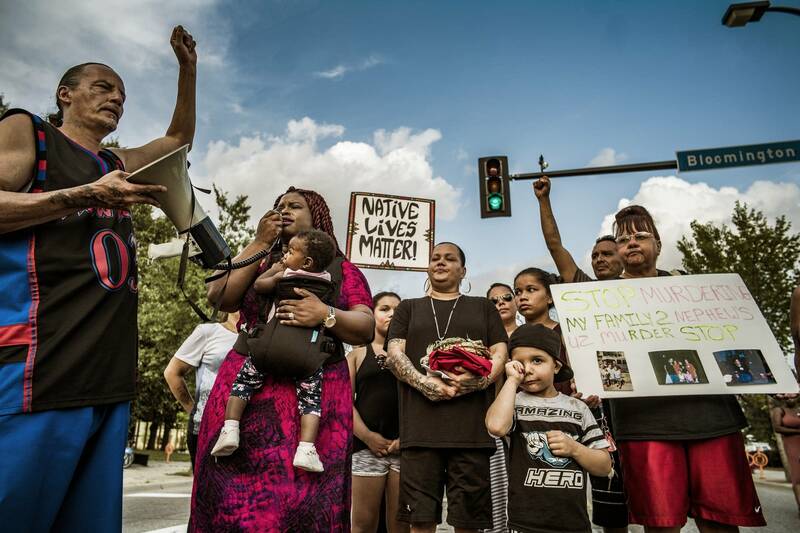 Prosecutors in Carver and Ramsey counties have yet to announce whether they'll decide to file charges against officers in the July 13 death of 16-year-old Archer Amorosi or 43-year-old Billy Hughes, who was killed Aug. 5. Over the next few weeks, MPR News will be exploring statute 609.066, which plays a major role in decisions about whether to charge police officers involved in high-profile fatal shootings.